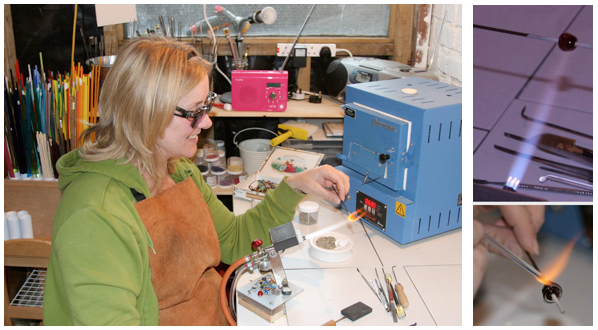 Glass bead making is known as ‘lampworking’ or ‘flameworking’, referring to the ancient origins of bead making. It must have been a laborious process before propane and oxygen mix torches, but with developments in technology it is possible to make glass beads in a domestic setting. There is pleasure in knowing that a bead one has made has the potential to last for a thousand years, and more. When a blob (known as a ‘gather’) of glass has melted sufficiently to be runny, but before it is totally melted (think of honey on a spoon) it is wound onto a steel rod known as a mandrel. To keep the glass separate from the metal, the mandrel must be dipped into a solution called ‘bead release’ or ‘bead separator’, this prevents the hot glass from bonding with the metal and makes it possible to remove the glass bead when it has cooled. The mandrel must be spun as the glass is applied to it, this helps to shape the bead and prevents the hot glass from sliding off the mandrel, using gravity and momentum well is crucial to bead making. Gradually the glass will be built up to the desired size, then shaped and decorated with different techniques until the bead maker is finished with the piece, at which point the bead can be placed into a kiln. The kiln process (known as ‘annealing’) improves the durability of a bead; a slow cooling programme is designed to remove the stress points in the glass and prevent it from cracking at a later date. When the bead has cooled completely it can be removed from the mandrel. To do this, the mandrel with the cooled bead on it should be put into water to dampen the release because the dry powdery bead release is potentially toxic when inhaled. The bead is removed by twisting it until it is loose, it can then be cleaned by scraping the mandrel in and out of the bead hole until the release is gone. Creating a bead is mostly a delight, however, there are some downsides…if the glass rod hasn’t been properly warmed before introducing it to the flame, it ‘shocks’, shatters, and scatters, little pieces of glass sticking to skin which can burn and scar (and really hurt), I wear a leather apron and keep burn treatment close at hand. The other is having to wear didymium glasses (over my prescription glasses) which have purple lenses and alter the way the colour of glass appears – I always have to remove the glasses in order to differentiate between red and orange glass rods, it’s so annoying to find that I have mistaken rods and muddled the two when I see the end result. However, the didymiums are essential because they make it possible to see what one is doing as they filter out the orange sodium flare that is generated when putting glass into the flame (see photo above, the top right flame picture was taken through didymium lenses, compare it to the bottom right photo, which was taken without). Without the glasses one could not attempt detailed work very successfully. Oh, and…hot glass looks different in colour to cold glass (red can look very black) so it does feel like a guessing game at times, one must get to know the palette, which has it’s complexities. It’s all about chemistry and physics. A mixture of oxygen and propane gas is used to melt the glass, you can see the lit torch in the picture. I have bottled gas, but use oxygen converters to make the oxygen, rather than buy it in. My oxycons are reconditioned ex-medical machines. Torches come in various sizes, mine is a Lynx. Glass comes in a wide variety of colours, in rods approximately the diameter of a pencil. There are different types of glass available, I mainly use ‘Effetre’, an Italian soft glass, another by a company called ‘CiM’ (Creation is Messy) and another called ‘Northstar’, the latter two brands originating in America. Not all glass is compatible, some varieties of glass are inexpensive, some quite the opposite such as pink glass. This will be reflected in the cost of a bead. Glass beads can be found at extremely low prices on the Internet and in bead shops, most of them are mass-produced in foreign countries (like China and India) in sweatshop conditions with little consideration for safety. Lampworkers like me have the privilege of being able to experiment and evolve as glass bead artists, and we have a choice over the conditions in which we work. We also set the standards for well made products, since learning to make beads I have learned to appreciate a properly flame polished bead (no ripples in the surface from a press) no ‘seams’ from a press, and beads with smooth edged holes, whether the bead is perfectly balanced in shape, or of a more ‘organic’ nature. When you own one of my beads you will have a unique piece made with a passion for quality, and joy in creative expression. Whether you wear it or just keep it to look at, I hope you enjoy your bead as much as I enjoyed making it.